Jump below for a comprehensive list of the projects referenced in this map, as well as an explanation of the style. Second Transbay Tube (3rd Street/West Side Alignment): The piece of infrastructure most needed in the Bay. The oft-discussed second transbay tube would alleviate congestion in the existing tube, provide a critical redundancy for the Bay’s sole rail crossing, as well as allow for 24-hour BART service. In addition, the proposed alignment would provide service to areas of the city currently without rail transit, including Geary Street, which today is serviced by the most ridden bus line west of the Mississippi, the 38. Completion of the Central Subway: The segment of the Central Subway from Brannan through Union Square to Chinatown is currently nearing completion. Proposals for an extension of the tunnel through North Beach (the portion to North Beach has actually already been built due to engineering requirements of the original project, making this stretch relatively easy to build) to Fisherman’s Wharf and to the Marina are shown here. More info here. CalTrain DTX (Mission Bay Alignment/I-280 Removal): City Hall knows we need this extension but has yet to commit funding. The Caltrain Downtown Extension (“DTX”) will take Caltrain from its current terminus at 4th and King to the new Transbay Terminal downtown. 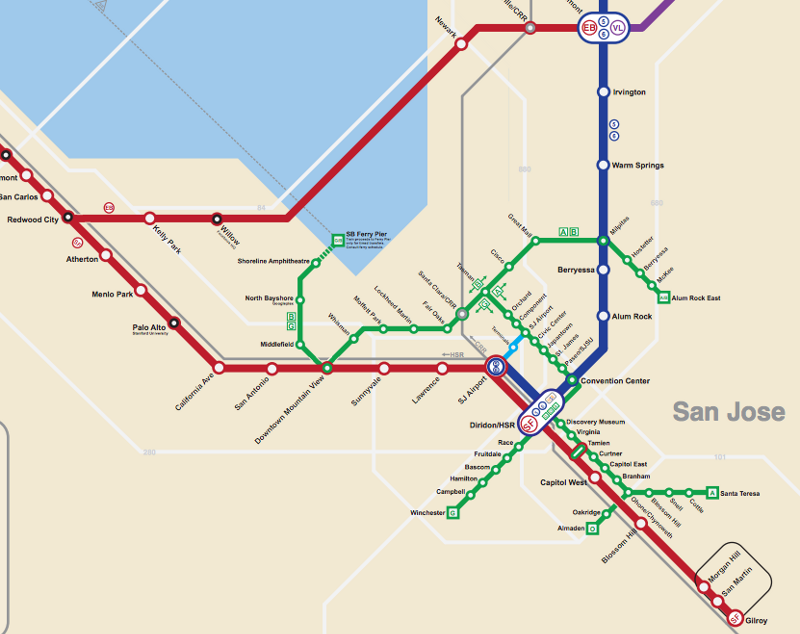 A recent proposal, shown on the BART Metro Map, reroutes Caltrain into a tunnel under 3rd Street and through Mission Bay to reach downtown. In tandem, the portion of I-280 which touches down near AT&T park would be demolished and replaced with a wide boulevard, similar to Octavia after the removal of theCentral Freeway and the Embarcadero after the removal of the Embarcadero Freeway following the 1989 Loma Prieta earthquake. Transbay Terminal pedestrian connection to Embarcadero Station: Once the new Transbay Terminal is complete, a tunnel running beneath Beale Street will connect the two stations, creating a unified transfer point between regional and local lines. Fort Mason Tunnel Rebuild: This project involves reconstructing the existing (now unused) tunnel between the western end of Fisherman’s Wharf (at Aquatic Park) and Fort Mason. The E-Line streetcar would be extended through the tunnel, providing service from downtown to Fort Mason and the Marina. Although the National Park Service has already conducted an environmental impact review for this project, it was put on permanent hiatusafter the economic downturn in 2008/9 (NPS is responsible as Fort Mason is a federally managed park). 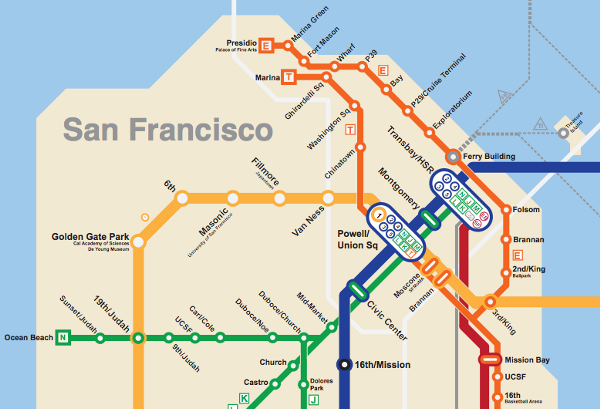 M-Ocean View Subway: Burying the M-Ocean streetcar line under 19th between Francis Circle and Randolph Street would enable faster and more reliable service to SFSU and Parkmerced. The SFCTA has already conducted a feasibility study for this proposal. Light Rail Modernization: This one is my own proposal. Currently, the J, K, L, M, N, and T lines operate as streetcars for much of their routes, which means that they don’t have a dedicated right of way. Without their own right of way, streetcars are forced to operate in mixed traffic with private vehicles, as well as stop for traffic signals, significantly reducing overall speed. With dedicated rights of way along their entire routes, these lines would operate more like light rail than like streetcars, resulting in a faster and more efficient transit system. In the same vein, this proposal also removes several less frequented stops. 30th/Mission Infill Station: The existing BART tunnel runs directly beneath this busy intersection, so constructing an infill station would be a relatively simple matter and would significantly increase transit access to this portion of the city. BART has repeatedly considered constructing this station since the agency’s inception. AirTrain Extension to Long-Term Parking: Because AirTrain stops just a few hundred feet short of SFO long-term parking, passengers must take a bus between the terminals and the garage. A short extension would solve this gap and enable seamless transit from baggage claim back to your vehicle. Treasure Island Ferry Service: A ferry terminal is currently under construction on Treasure Island in anticipation of new residential developments. Second Transbay Tube (I-980 Removal/Alignment): Transit riders in the Bay have long dreamed of a second transbay tube, but this particular spin on its East Bay alignment brings numerous and obvious benefits. Touted by the organization “Connect Oakland,” this proposal involves removing I-980 — one of the least traveled freeways in the Bay — and turning it into a boulevard similar to Octavia, the Embarcadero, and the proposed I-280 demolition corridor in San Francisco. A new BART tunnel would run beneath this boulevard before stopping at Jack London Square, and submerging under Alameda towards San Francisco. This plan would reconnect West Oakland with Downtown, neighborhoods long separated by I-980’s very wide right of way. 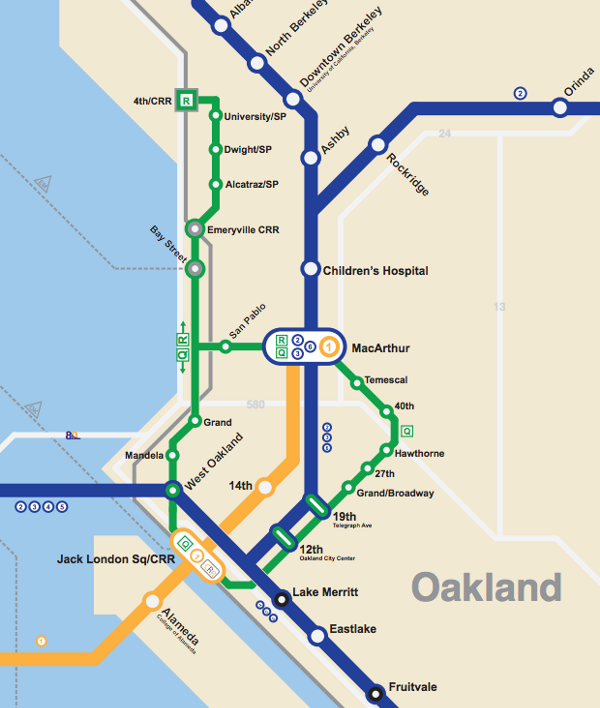 EBOT Streetcar: This proposal would create a streetcar through Emeryville to Berkeley and Oakland, providing a transportation link along a growing corridor and connecting underserved areas to regional transit. Variations of the proposal (including the one shown here) include a line down Broadway, which would connect Emeryville and West Oakland with Downtown and BART, as well as creating transit loop around central Oakland. Transit loops are increasingly popular in urban rail construction because they allow riders to reach stations outside of downtown without first heading to the urban center and then back out. In addition, they alleviate pressure on overcrowded lines by dispersing riders to other lines. Hegenberger Infill Station: The original plan for the Oakland Airport extension included a stop at Hegenberger to service the busy airport hotel area. BART Livermore Extension: This extension would take BART to downtown Livermore, a major employment center due to the presence of the Lawrence Livermore National Laboratory. eBART: Despite its name, eBART is diesel-powered. The project, currently under construction, will introduce diesel trains between Bay Point and locations further in Contra Costa. Riders will be required to switch at Bay Point from the electric BART trains to the diesel eBART trains. BART is utilizing diesel as it is significantly cheaper than extending the existing electric line. CalTrain Electrification: CalTrain is currently upgrading its infrastructure to run electric trains, replacing its existing diesel fleet. Electrification will allow faster and more frequent service as trains will require significantly less time and distance to accelerate to full speed. Once this project is completed, CalTrain will operate at frequency on par with that of BART. Dumbarton CalTrain: This ambitious plan would rebuild the defunctDumbarton Rail Bridge, creating a second CalTrain line which would reach into the East Bay. 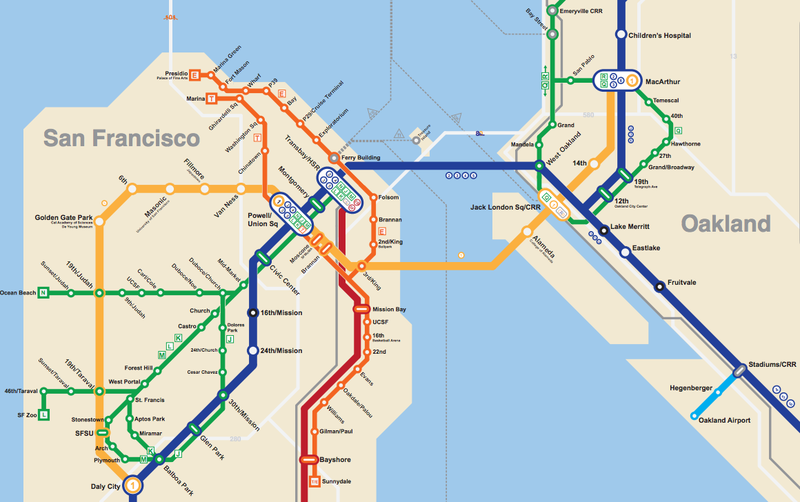 This service would allow commuters from the southern East Bay to bypass Oakland and proceed directly into downtown San Francisco via the Peninsula. Facebook has invested $1 million in studying alternative transportation options to its campus in Menlo Park, a portion of which is set aside to study the possibility of reactivating the rail line. BART San Jose Extension: This extension is currently under construction and will bring BART in proximity to the San Jose Airport via a tunnel through Downtown San Jose. In doing so, this extension will complete the passenger rail loop around the bay and link the anchor cities of the Bay Area like never before. 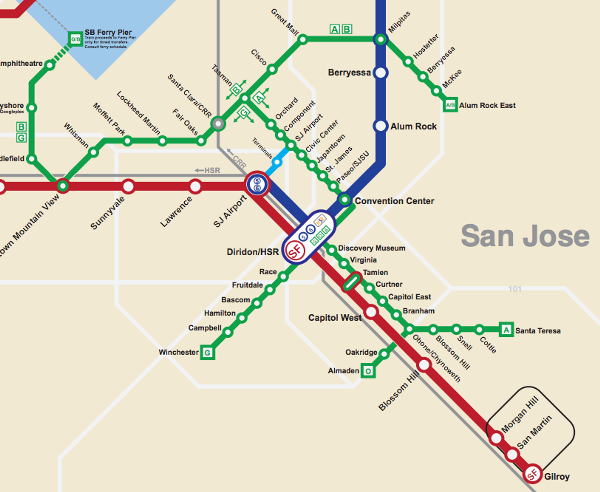 The project below will provide direct connection from the BART station to the SJ Airport terminals. SJ Airport People Mover: The San Jose Airport is a considerable distance both from the existing VTA Light Rail stop as well as from the future BART station. A planned people mover would link the two stations with a tunnel under the airport’s runway. SMART: Opening soon! The Sonoma-Marin Area Rail Transit’s initial stretch is set to open this year. 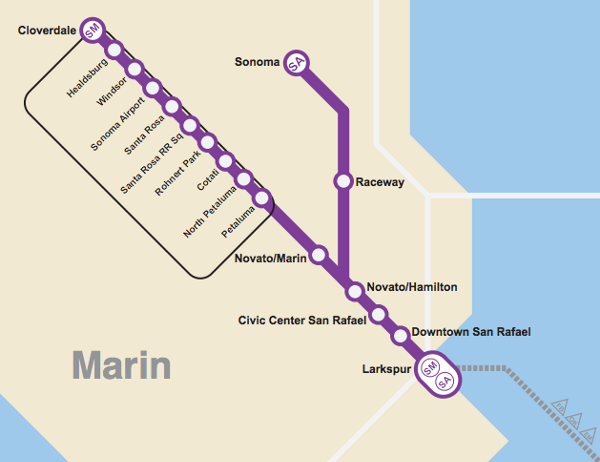 A planned (and funded)extension will take the new transit system to the Larkspur Ferry terminal, connecting Marin via ferry service to the rest of the region. SMART Extension to Sonoma: SMART owns the existing right of way leading from Novato to Sonoma, providing an easy opportunity for future expansion. Rail service would connect Sonoma to the rest of the region as never before. As a novice at mapmaking, I will be the first to admit that several aspects of this map are very confusing for wayfinding. 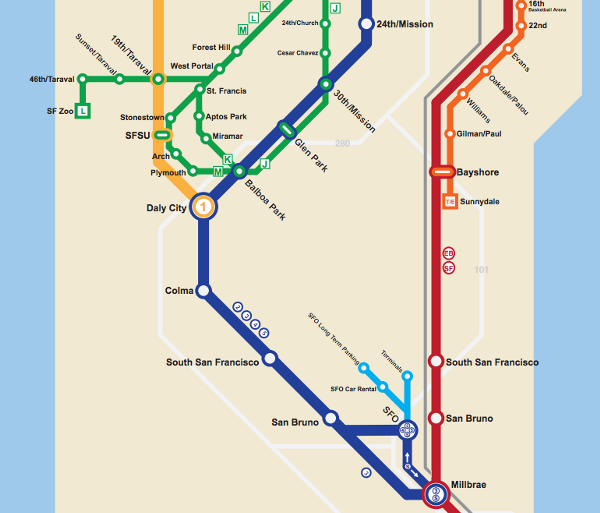 My only other project is a hypothetical metro map for Berkeley. 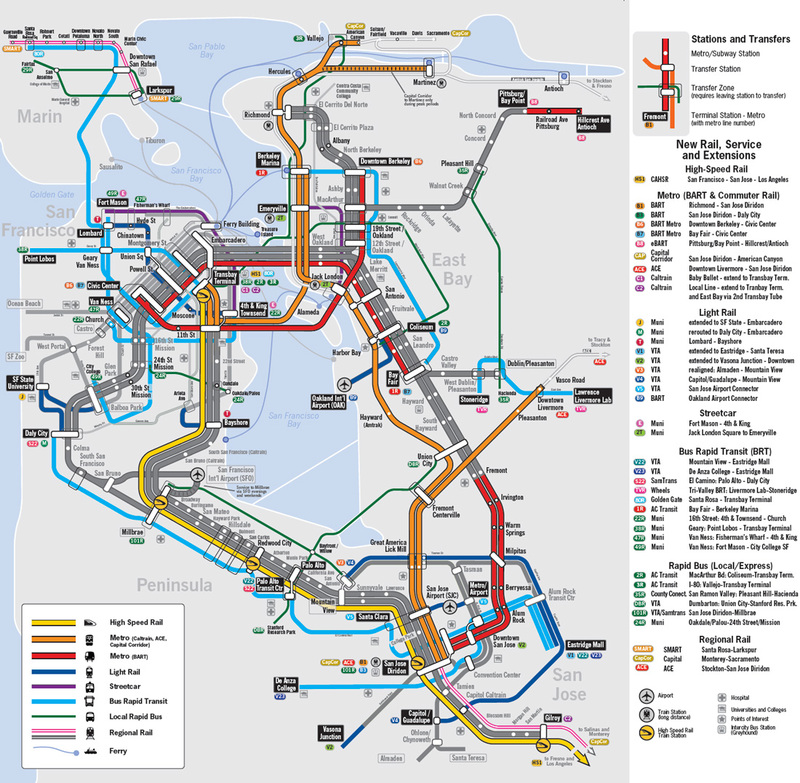 The BART Metro Map is intended as an overview of future service more than as an actual usable map. However, I do think that it is possible to find one’s way using this map. The wayfinding system itself is based on the New York City Subway, which separates its “services” based on the interoperability of its various “lines”, which were constructed by several different private and public entities. 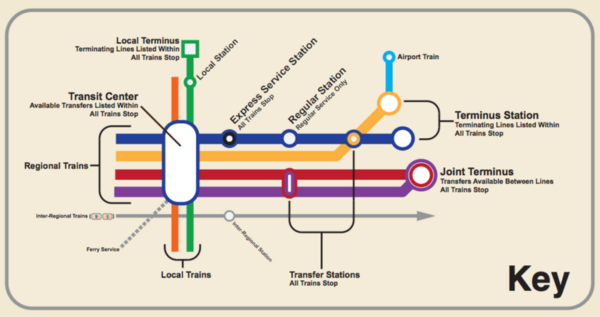 Similarly, this map separates lines based on the idea of interoperability. 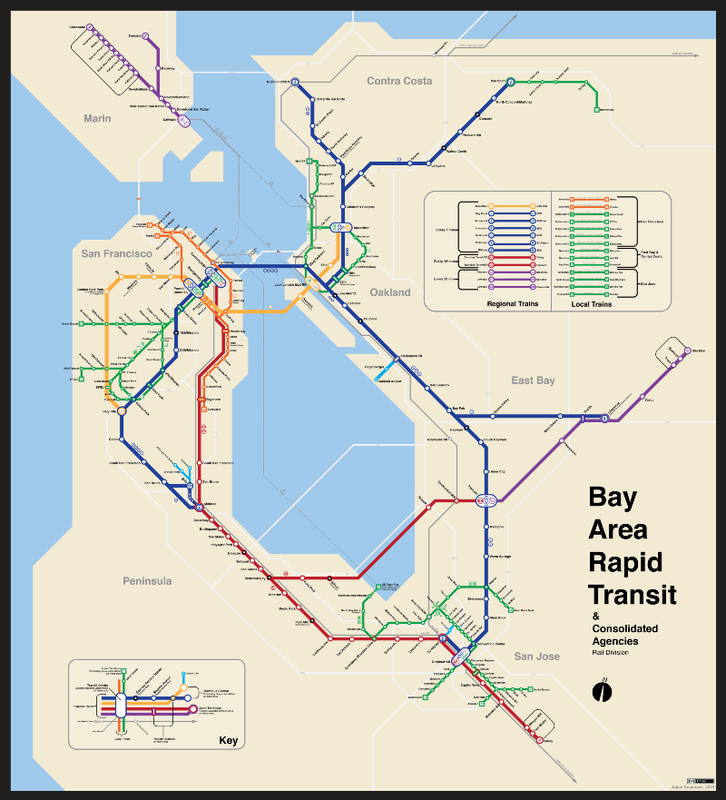 The present day services — BART, Caltrain, Muni, etc. — are separated by color because you must exit one service to enter another. The style is typical of contemporary metro maps around the world, which are technically abstract diagrams rather than geographic maps. This style has its origin in the London Tube map, which created abstract maps and regularized 45-degree angles (thanks to Harry Beck). Thanks for reading! If anyone is interested in seeing the full resolution version, please email me at adam.susaneck@gmail.com. Happy to answer any questions in the comments.